Premise: Two teams comprised of two civilian kid contestants and a celebrity player compete in a series of three rounds. In the first round, “Get A Clue”, two players will try to draw as many words as they can in 90 seconds. One person will draw on one screen and if the guessing player has not given the correct answer at that point, the drawing will move to another screen prompting the second player to continue the drawing. 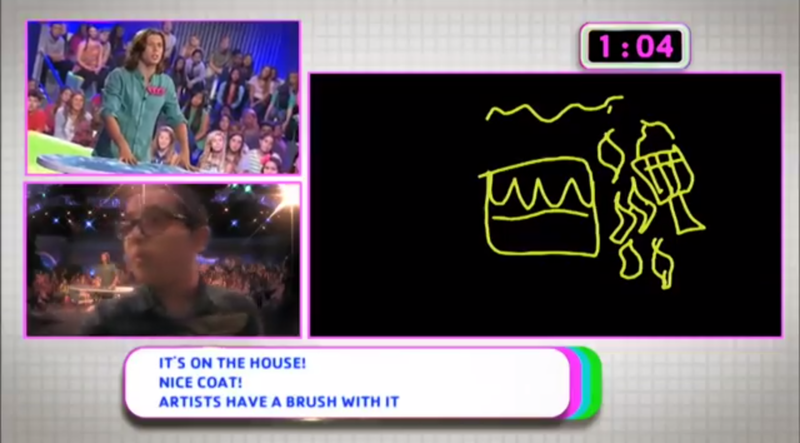 The host will give up to three clues to the word while the two artists are drawing. Players rotate positions after every drawing and each correct answer is worth 10 points. In round two, “DRAW-stacle Course”, each player will take turns drawing on each of the three screens, with each screen possessing a special twist in order to make the words more difficult to draw. Some of the stunts include “Drawing In The Dark”, where the players draws while wearing a darkened visor, “Art Thief”, where periodically the drawing disappears forcing the player to start the drawing over and “Unbalanced Artist”, where the player must draw while standing on a small see-saw. Each team will have 90 seconds and each correct answer is worth 10 points. In the third round, “Fill In The Blank”, the host will read a sentence with a word or phrase missing and one player will have to draw the missing answer with the other two players guessing. Each team will have 90 seconds and each correct answer worth 20 points. The team with the most points will win the game and will get to play in the bonus prize round. Should a tie occur, the host will draw one picture and the first team to buzz-in with the correct answer will win the game (similar to the tie-breaking round on the late 90’s version of Pictionary). However, if a player gives an incorrect answer, the other team will automatically win the game. In the bonus round, the winning team will pair with the two celebrity guest players and will have 90 seconds to draw and guess up to four words correctly. If the team passes on any words in this round, they may not go back to the word. Some of the bonus round variations include “Sit & Spin”, where players draw while sitting on a spinning chair, “The Wand”, where players draw in the air using a wand-shaped stylus and “Follow Your Art”, where the players’ drawing moves from screen to screen forcing them to follow it to continue drawing. Each correct answer wins the contestants a prize, up to four if they get them all right. When I heard that Disney was going to be reviving Win, Lose or Draw for a second time, I took it upon myself to check out an episode of Disney Channel’s first attempt at recreating the show for kids and teens. Hosted by Marc Price, this late 80s/early 90s version of the show had a decent three-season run from 1989-1992 and was fair in terms of production value (although I’m not sure why the producers chose to add a mascot to the show whose name [Tyler, The Incredible Spotted Wonder Puppy] didn’t even reflect on the show’s artistic-based theme). Disney’s 2014 revival of Win, Lose or Draw easily puts Teen Win, Lose or Draw away. 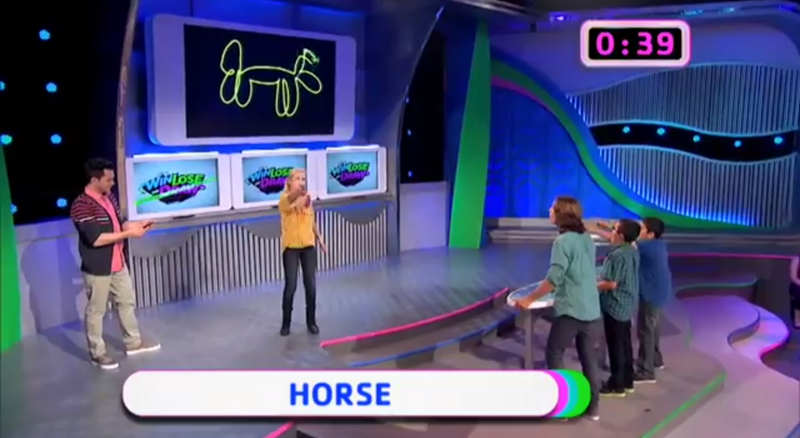 First of all, unlike the network’s first attempt at recreating the quick draw game show, the current version relies on original and creative concepts for its format rather than recycling gameplay elements seen on past game shows, such as the 1989 version borrowing the “Password Plus/Super Password Puzzle” concept for its Clue Round. With the inclusion of the variety of drawing challenges in the DRAW-stacle Course and bonus round, along with making the game more physically demanding by having the teams rotate artists per word, the producers have done an excellent job of recreating Win, Lose or Draw by making it more fun to play and watch and of maintaining Disney Channel’s reputation of making solid kids’ game shows. One of my personal favorite stunts on the show is “The Wand” and how the challenge truly test how well the players can draw in the air without the aid of a concrete sketching area under the pressures of a brief time limit. I also admire the inclusion of certain elements to make the game more engaging from the home viewer’s perspective such as not revealing the player’s scores until the end of each round and displaying the clues to each player’s drawing, rather than the answer (with the exception of the bonus round). The excellent play-along factor alone will not only keep the viewers tuned in all show, but could also inspire families to start or continue their very own “family game night” by playing this game at home as well Disney to create a home game (or a Kinect/Wii designed video game, nowadays). Beside the celebrity guest contestants, one aspect I’m glad this version carried over from the Teen version is the cool prizes the kids could win. In the couple of episodes I’ve seen, contestants have won a Kindle Fire HD Tablet, a Nintendo Wii U Deluxe and a 40” LED TV. Not bad for roughly 22 minutes of drawing and guessing. Aside from the cool touchscreen digital sketch pads, the set itself is decent and could use a lighter color for the backdrop instead of sticking with a “dark” set. However, the show’s upbeat, dance party main theme music, spacious gaming area and studio audience densely populated with excited and exuberant kids make up for it. As host, as he has proven in past with hosting The Hub’s Scrabble Showdown, Justin Willman is a great choice to host this show. He has good comedic timing and relates well with the kids on the show, which is a lost art when it comes to hosting a kids show. The only problem I have with the show is that the prize reveal is meshed in with the show’s closing. Albeit it’s a minor problem and maybe I’m just old fashioned, but prize descriptions and watching the excitement and zeal on a contestant’s face while they are listening to what they have won definitely adds to any game show and makes it that more interesting to watch. Overall, Disney did an excellent job of reviving Win, Lose or Draw. This is a vast improvement on the network’s first attempt at creating a kids’ version of the series from its upbeat atmosphere to the fast-paced gameplay to the amazing prizes. Besides Mad Libs, this is one of the best game shows I’ve seen on the Disney Channel. I believe this show will at least receive a second season renewal and I will be very surprised if it doesn’t. Watch new episodes of Disney’s Win, Lose or Draw weekdays at 5:00pm ET on Disney Channel! You can only win FOUR prizes. The wand is impossible to use,resulting in few successful guesses. There are NO parting gifts and no prize for winning the game. That became a problem on a recent show, when a black team won,but got the wand game and won NO prizes,at all,even though they won.This show is TOO cheap. They could also- score the upfront game in cash and not lose very much either. 1: There have been plenty of kids game shows that have had no prizes at stake in the main game, (“Legends of The Hidden Temple”, “Get The Picture” [Season 2], “Mad Libs”, “BrainSurge”, “Fun House” [to my knowledge]) — this aspect doesn't necessarily affect the quality of the show, unless it was like “Wild And Crazy Kids”, where there were NO prizes at stake. 2. While I do agree with you about how the show should have consolation prizes for losing contestants and contestants who struck out in the Prize Round, the prize budget is not bad for the show. For example, on one episode, a team had cleaned up & won all four prizes including a $200 Old Navy Gift Card, a Bean Bag Gaming Lounger, Tickets to a Baseball Game + $300 in Dodger Dollars and a 40″ LED TV — totaling over ~$1,000 in prizes. That's not a bad day for a kids game show. 3. There has been at least one instance where a team guessed all four drawings correctly playing “The Wand” bonus game. It's just one of those games that takes a steady hand, concentration and a lot of artistic skill. 1.Legends…& Brian Surge eliminated you, with a prize. Fun House (at the time) almost gave away too many parting gifts, a rarity for the genre. Get the Picture- the usual gifts, which is fine. I can't speak to Mad Libs since that was off the air, rather quickly. 2. Agreed. Still, the show could do a fifth puzzle and award a vacation. 3. I was not aware of this. I look forward to that show.